What is food history? It can be almost anything, from cooking your mum’s meat loaf to following a recipe in a decades-, or even centuries-old, cook book. It can mean writing about food of the past, an activity that stretches from the halls of Academe (which has taken to the subject assiduously in recent years), to blogging on old menus as I sometimes do, to writing sophisticated, nuanced works such as by M.F.K. Fisher or Elizabeth David, or the food blogs and surviving food magazines. But surely the most obvious form of food history is eating, literally, food of the past. That’s not really possible, you say. Food is perishable by definition. True, there is canned food, and famously people sometimes will sample from a tin found in a shipwreck or something of that order, but the chances to do that are minimal for most people. In the world of drinks, the matter is quite different, as old wine, beer, and liquor can be consumed with little risk usually. People sometimes do this who have access, but I am talking here of food. There is one area though where food history is living in the most palpable sense. The sources are not that hard to find, or haven’t been until recently anyway. A sub-culture in the United States sources and tastes military rations from different eras, some stretching back to the world wars and even earlier. The leading practitioner is Florida-born Steven Thomas, and he has posted many videos on youtube describing his finds and the tastes of foods he tries. As cigarettes were packed in old rations sometimes and he smokes, he will offer opinions, say, on 1940s Chesterfields. I smoked decades ago and some of his descriptions remind me of 1970s unfiltered Camels, Philip Morris, or Old Gold. Nor has Thomas’ work remained within the precincts (valuable as they are) of youtube. He was profiled in the pages of no less than the Financial Times magazine two years ago, read it here with descriptions of foods he tasted. His observations on enduring national food preferences in the rations are interesting too. For example, it seems Italian soldiers sometimes get a shot of grappa with breakfast. British soldiers get their share of pudding and tea. I find this area quite fascinating. By the way he has never gotten ill from eating an old ration (he did from eating a current one, he explains what happened in the story). He takes simple precautions – the visual and smell test, basically – but has remained hale even after eating Civil War hardtack, say, or tinned Boer War beef packed by Bovril. Here is a sample video, for a U.S. Army field ration from 1943. This is not a novelty exercise, he expresses himself well and the comments are often of real interest. He and his colleagues who do this – they have already held a convention, perhaps to become annual – are certainly food historians. They should be profiled in the North American food media as well as more specialized journals. Food history must be thought of beyond the conventional. More broadly, the popular food world is not just latest trends such as bone broth, food halls, and vegan burgers. 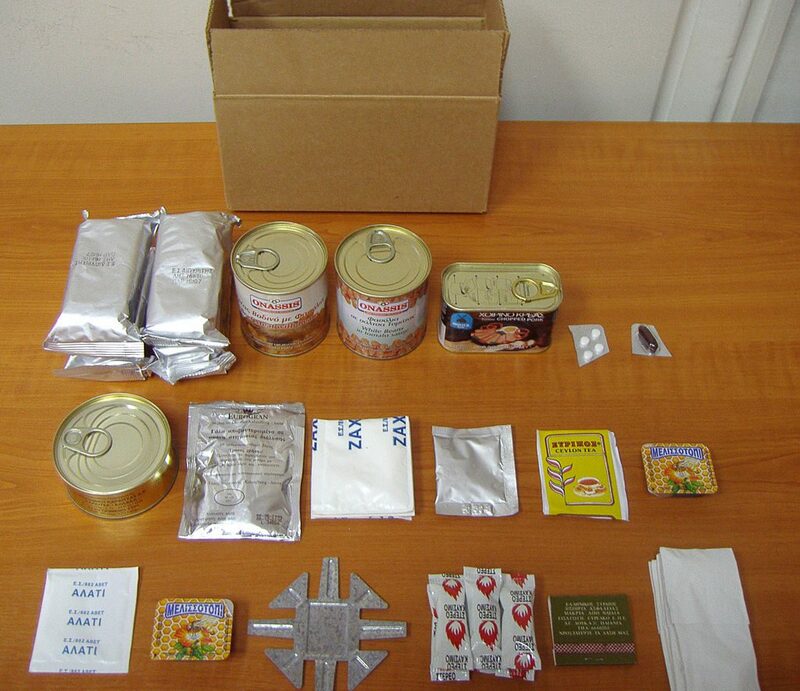 Note re image: The image shown is a Greek field ration of c.2013. It was sourced from Wikipedia’s entry on field rations, here. All intellectual property in the image belongs to its sole owner. Image is used under terms of the stipulated Creative Commons open access (3.0) license, see text here. Image used for educational and historical purposes. All feedback welcomed.